Coal is a black or brownish-black sedimentary rock composed primarily of carbon, along with other assorted substances, including sulfur. It is extracted by underground mining or open-pit mining. As a readily available, combustible material, it is an extremely significant fuel for the generation of heat and electricity. Approximately 40 percent of the world's electricity production depends on coal, making it the largest single source of electricity worldwide. In the United States, coal power plants generate about 50 percent of the electricity produced. Yet, coal mining has historically been a dangerous occupation, exposing miners to lung diseases and causing many deaths by such problems as collapsing mines and gas explosions. In addition, mining methods can damage the land, and sulfur-rich coal stacks, when washed by rainfall, generate acidic flows that can leach metallic elements into nearby water courses. The process of burning of coal generates waste products that include sulfur dioxide gas (which can convert to sulfur trioxide and then to acid rain), heavy metals, and radioactive elements. Through government regulations and technological improvements, these problems have been significantly reduced. The word "coal" was derived from the Anglo-Saxon col, meaning charcoal. Coal has also been called pitcoal, indicating that it came from pits, that is, mines. An alternative term has been seacoal, probably because it came to many places in eastern England, including London, by sea. Another explanation is that it was occasionally found on beaches, having fallen from exposed coal seams above or washed out of underwater coal seam outcrops. In the United States and Britain, the word coal is a mass noun when referring to the unburned mineral, while individual pieces are called "lumps of coal." The plural "coals" is conventionally used for types of coal, or for pieces of burning coal, charcoal, or wood. In popular culture, coal is associated with the astrological sign Capricorn. Some thieves carried it in the belief that it would protect them from detection and help them escape when pursued. A dream of burning coals has been thought to symbolize disappointment, trouble, affliction, and loss, but a dream showing brightly burning coals was taken to indicate the promise of upliftment and advancement. Children are sometimes led to believe that if they are naughty, Santa Claus would leave a lump of coal instead of gifts in their Christmas stockings. Carbon constitutes more than 50 percent by weight and more than 70% by volume of coal (which includes inherent moisture). These figures vary based on the type or "rank" of coal—higher ranking coals contain progressively more carbon and less hydrogen, oxygen, and nitrogen. Lignite: Also referred to as brown coal, it is the lowest rank of coal and is high in moisture content and ash content. It is used almost exclusively as fuel for steam-electric power generation. Jet is a compact form of lignite that is sometimes polished and has been used as an ornamental stone since the Iron Age. 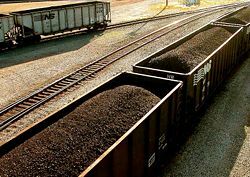 Sub-bituminous coal: Its properties range from those of lignite to those of bituminous coal, and it is used primarily as fuel for steam-electric power generation. Bituminous coal: This is a dense coal, usually black, sometimes dark brown, often with well-defined bands of bright and dull material. It contains a tar-like substance called bitumen. It is used primarily as fuel in steam-electric power generation, with substantial quantities also used for heat and power applications in manufacturing and to make coke. 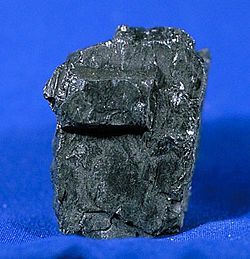 Anthracite: This is the highest rank of coal, with a carbon content of 92–98 percent. It is used primarily for residential and commercial space heating. To prevent spontaneous combustion, coal is usually mined wet and may be stored wet. For this reason, the carbon content of coal is quoted in two ways: "as-mined" and "moisture-free." Lignite and other low-ranking coals contain a considerable amount of water and other components known as "macerals." Much of the moisture is incidental and is trapped between the coal particles. In addition, low-ranking coal may contain high levels of carbohydrates such as cellulose, in which hydrogen and oxygen atoms are attached to carbon atoms. This is because coal is converted from carbohydrate material into carbon by an incremental process (see below). Therefore, the carbon content of coal depends heavily on the degree to which this cellulose component is preserved in the coal. Other constituents of coals include mineral matter, usually silicate minerals—such as clays, illite, and kaolinite—as well as carbonate minerals like siderite, calcite, and aragonite. Iron sulfide minerals such as pyrite are common constituents of coals. Sulfate minerals are also found, as are trace amounts of metals, notably iron, uranium, cadmium, and (on rare occasions) gold. Methane gas is another component of coal. Methane in coal is dangerous, as it can cause coal seams to explode, especially in underground mines, and may cause the coal to burn spontaneously. Careful mining, however, can include a process to extract the methane, which is a valuable fuel. Dicrhodium fern fossils in drill core from coal beds in Queensland. Coal essentially always includes fossil imprints such as these, suggesting that coal was formed from plant matter. According to the generally accepted model, coal originated from plant remains that were compacted, hardened, and transformed by heat, pressure, and chemical reactions over geologic time. It may be formed in swamp ecosystems in lowland sedimentary basins, such as the peat swamps of Borneo today. These places of coal formation are often called "coal forests." When plants die in these peat swamps, their biomass is deposited in anaerobic aquatic environments, where low oxygen levels prevent their complete decay by bacteria and oxidation. For masses of undecayed organic matter to be preserved and form economically valuable coal, the environment must remain steady for prolonged periods of time, and the waters feeding these peat swamps must remain essentially free of sediment. This requires minimal erosion in the uplands of rivers that feed the coal swamps and efficient trapping of sediments. Eventually, the coal forming environment ceases. In most cases, this is abrupt, with the majority of coal seams having knife-sharp upper contact with the overlying sediments. This suggests that the onset of further sedimentation quickly destroys the peat swamp ecosystem and replaces it with meandering stream and river environments. removal of hydroxyl (OH) groups from the cellulose and other plant molecules, resulting in the production of hydrogen-reduced coals. Generally, to form a coal seam 1 meter thick, between 10 and 30 meters of peat is required. Peat has a moisture content of up to 90 percent, so loss of water is of prime importance in converting peat into lignite. Chemical and physical processes convert lignite successively into sub-bituminous coal, bituminous coal, anthracite, and graphite. Evidence of the types of plants that contributed to carbonaceous deposits can occasionally be found in the shale and sandstone sediments that overlie coal deposits and in the coal. Fossil evidence is best preserved in lignites and sub-bituminous coals, though fossils in anthracite are not too rare. To date, only three fossils have been found in graphite seams created from coal. The greatest coal-forming period in geologic history was the Carboniferous era (280 to 345 million years ago). Further large deposits of coal are found in the Permian, with lesser but still significant Triassic and Jurassic deposits, and minor Cretaceous and younger deposits of lignite. In Europe, Asia, and North America, Carboniferous coal was formed from tropical swamp forests. 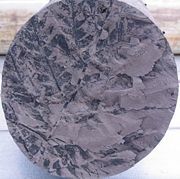 In the southern hemisphere, Carboniferous coal was formed from flora that grew on the cold tundra, near the periphery of the glacial regions, in a supercontinent called Gondwana. In the modern European lowlands of Holland and Germany, considerable thicknesses of peat have accumulated, suggesting the ubiquity of the coal-forming process. Thomas Gold, in his book The Deep Hot Biosphere: The Myth of Fossil Fuels, challenges the accepted theory of coal formation and proposes an alternative theory. According to his model, which remains a minority viewpoint, black coal is continually created by bacteria living on upwelling methane and other hydrocarbons under the Earth's crust. This model makes a distinction between brown and black coal, stating that only brown coal is formed by the classical process of decomposition. It is interesting to note that some metallic elements (such as nickel, vanadium, chromium, arsenic, mercury, cadmium, lead, and uranium) are present in black coals. The most economical of methods of coal extraction from coal seams depends on the depth and quality of the seams, and also the geology and environmental conditions of the area being mined. Coal mining processes are generally differentiated by whether they operate on the surface or underground. A coal mine and its accompanying structures are collectively known as a colliery. If the coal seams are near the surface, the coal is extracted by "strip mining," which exposes the coal by the advancement of an open pit or strip. 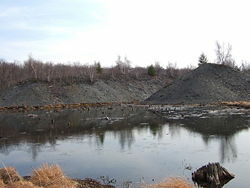 As the coal is exposed and extracted, the overburden from the still-covered coal fills the former pit, and the strip progresses. Most open-cast mines in the United States extract bituminous coal. In South Wales, open casting is done for steam coal and anthracite. Mountaintop removal levels the land with explosives. Then the overburden (the mountain) is pushed into a nearby valley or hollow. The coal is transported to a processing plant where it is washed. The waste from this process is stored in earthen dams containing millions or even billions of gallons of slurry. Most coal seams are too deep underground for open-cast mining and thus this type of mining is therefore called underground mining. In deep mining, the "room and pillar" method progresses along the mammoth coal vein seam, while pillars and timber are left standing to support the coal mine roof. An extremely dangerous method of operation in deep mining is known as robbing the pillars. In this method, the miners attempt to remove the timbers and retreat between them to get coal out of the main seam, allowing the roof to cave in. This method of mining, used principally in the United States, contributed to many fatalities in the early history of coal mining. Currently, there are four major underground mining methods, noted below. Longwall mining: It accounts for about 50 percent of underground production. The longwall shearer, with a face of 1,000 feet or more, is a sophisticated machine with a rotating drum that moves mechanically back-and-forth across a wide coal seam. The loosened coal falls onto a pan line that takes the coal to the conveyor belt for removal from the work area. Longwall systems have their own hydraulic roof supports for overlying rock that advance with the machine as mining progresses. As the mining equipment moves forward, overlying rock that is no longer supported by the coal that has been removed is allowed to fall behind the operation in a controlled manner. The supports allow for high levels of production and safety. Sensors detect how much coal remains in the seam, while robotic controls enhance efficiency. Longwall systems can have a 60–80 percent coal recovery rate, when the surrounding geology permits their use. Continuous mining: It utilizes a machine with a large rotating steel drum equipped with tungsten carbide teeth that scrape coal from the seam. Operating in a "room and pillar" system, where the mine is divided into a series of 20–30 foot "rooms" (work areas) cut into the coalbed, it can mine as much as five tons of coal per minute—more than a miner of the 1920s would produce in an entire day. Continuous mining accounts for about 45 percent of underground coal production. It also utilizes conveyors to transport the coal removed from the seam. Remote-controlled continuous miners are used to work in a variety of difficult seams and conditions, and robotic versions controlled by computers are becoming increasingly common. Conventional mining: This is an older practice that uses explosives to break up the coal seam, after which the coal is gathered and loaded onto shuttle cars or conveyors for removal to a central loading area. This method consists of a series of operations, beginning with "cutting" the coalbed so it will break easily when blasted with explosives. This type of mining accounts for less than 5 percent of total underground production in the United States today. Shortwall mining: Accounting for less than 1 percent of deep coal production, shortwall mining involves the use of a continuous mining machine with moveable roof supports, similar to longwall. The continuous miner shears coal panels 150–200 feet wide and more than a half-mile long, depending on geological conditions. Coal is the fastest growing energy source in the world (BP Statistical Energy Review, June 2005). It is used primarily as a solid fuel to produce heat through combustion. The heat is usually tapped to produce electricity. Approximately 40 percent of the world's electricity production depends on coal. When used to generate electricity, coal is usually pulverized and burned in a furnace connected to a water boiler. The furnace heat converts boiler water to steam, which is then used to drive turbines that move generators and create electricity. The entire process has a thermodynamic efficiency of about 35–40 percent. The annual consumption of coal worldwide is about 5,800 million short tons (5.3 petagrams (Pg)), of which about 75 percent is used to produce electricity. The region that includes China and India uses about 1,700 million short tons (1.5 Pg) annually, forecast to exceed 3,000 million short tons (2.7 Pg) in 2025. The United States consumes about 1,100 million short tons (1.0 Pg) of coal each year, using 90 percent of it for generation of electricity. High prices of oil and natural gas are leading to increased interest in technologies such as coal gasification and liquefacation. Gasification breaks down coal into its components, usually by subjecting it to high temperature and pressure, using steam and measured amounts of oxygen. This leads to the production of carbon dioxide and oxygen, as well as other gaseous compounds. Gasification is also a possibility for future energy use, as it generally burns hotter and cleaner than conventional coal and can drive a more efficient gas turbine rather than a steam turbine. Gasification produces a much higher concentration of carbon dioxide than direct combustion of coal in air (which is mostly nitrogen). The higher concentration of carbon dioxide makes carbon capture and storage more economical than it otherwise would be. Coal can also be converted into liquid fuels like gasoline or diesel by several different processes. The Fischer-Tropsch process of indirect synthesis of liquid hydrocarbons was used in Nazi Germany and South Africa, because the regimes there were politically isolated and unable to purchase crude oil on the open market. Coal was gasified to make syngas (a balanced mixture of carbon monoxide and hydrogen gas), and the syngas was condensed using catalysts to make light hydrocarbons that were further processed into gasoline and diesel. Syngas can also be converted to methanol, which can be used as a fuel or fuel additive, or further processed into gasoline via the Mobil M-gas process. During World War I and World War II, Germany used the Bergius process for the direct liquefaction of coal by a reaction called hydrogenation. Several other direct liquefaction processes have been developed, including the SRC-I and SRC-II (Solvent Refined Coal) processes developed by Gulf Oil and implemented as pilot plants in the United States in the 1960s and 1970s. Yet another process to manufacture liquid hydrocarbons from coal is known as low-temperature carbonization (LTC). Coal is coked at temperatures between 450 and 700 °C, compared to 800 to 1000 °C for metallurgical coke. These temperatures optimize the production of coal tars richer in lighter hydrocarbons than normal coal tar. The coal tar is then processed into fuels. All these liquid fuel production methods release carbon dioxide in the conversion process, far more than is released in the extraction and refinement of liquid fuels from petroleum. If these methods were adopted to replace declining petroleum supplies, carbon dioxide emissions would be greatly enhanced globally. For future liquefaction projects, carbon dioxide sequestration has been proposed to avoid releasing it into the atmosphere. Sequestration, however, will add to the cost. Coal liquefaction is one of the "backstop technologies" that could potentially limit the escalation of oil prices and mitigate the effects of transportation energy shortages. This is contingent on liquefaction production capacity becoming large enough to satiate the very large and growing demand for petroleum. Also, a risk is that the extra carbon dioxide released in the process could accelerate the process of global warming. Estimates of the cost of producing liquid fuels from coal suggest that domestic U.S. production of fuel from coal becomes cost-competitive with oil priced at around 35 USD per barrel,  (break-even cost). This price, while above historical averages, is well below current oil prices. This makes coal a viable financial alternative to oil for the time being, although production is not high enough to make synfuels viable on a large scale. Coke is a solid, carbonaceous residue derived from low-ash, low-sulfur bituminous coal. The volatile constituents of this coal are driven off by baking in an oven without oxygen at temperatures as high as 1,000 °C, so that the fixed carbon and residual ash are fused together. Coke is used as a fuel and as a reducing agent in smelting iron ore in a blast furnace. Coke from coal is gray, hard, and porous and has a heating value of 24.8 million Btu/ton (29.6 MJ/kg). Byproducts of this conversion of coal to coke include coal-tar, ammonia, light oils, and "coal-gas." "Petroleum coke" is the solid residue obtained from oil refining. It resembles coke but contains too many impurities to be useful in metallurgical applications. Historically, coal mining has been a dangerous activity, leading to many deaths. The chief hazards include slope failure in the case of open-cast mines, and roof collapse and gas explosions in the case of underground mining. Most of these risks have been greatly reduced in modern mines, and multiple fatality incidents are now rare in the developed world. In lesser developed countries, however, thousands continue to die annually in coal mines. China, which leads the world in the production and consumption of coal, has the highest number of deaths related to coal mining worldwide, with official estimates of around 6,000 fatalities in 2004. Chronic lung diseases, such as pneumoconiosis (black lung disease) are common in miners, leading to reduced life expectancy. A less common lung disease is pneumoultramicroscopicsilicovolcanoconiosis, which results from inhaling fine silica. In addition, black damp, a mixture of carbon dioxide and nitrogen in a mine, can cause suffocation. Coal sludge in Mildred, Pennsylvania. Many of these risks have been reduced by improvements in mining methods (such as through longwall mining), hazardous gas monitoring (by using safety lamps and more modern electronic gas monitors), gas drainage, and ventilation. Statistical analyses by the U.S. Department of Labor’s Mine Safety and Health Administration (MSHA) show that between 1990 and 2004, the industry cut the rate of injuries (a measure comparing the rate of incidents to overall number of employees or hours worked) by more than half and fatalities by two-thirds following three prior decades of steady improvement. According to the Bureau of Labor Statistics, coal mining is not even among the top 10 most dangerous occupations in America per capita. Pilots, truck and taxi drivers, loggers, fishermen, roofers, and workers in other occupations face greater on-the-job risks than coal miners. Coal mining frequently has significant adverse environmental impacts. In the past, strip mining severely damaged or destroyed most of the environmental value of the land. 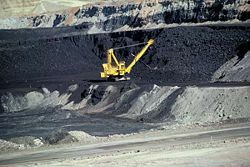 In response to the negative environmental effects of coal mining and the abundance of abandoned mines, the U.S. government enacted the Surface Mining and Reclamation Act of 1977, requiring future coal mining sites to have reclamation plans. These plans must be approved by federal, state, and local authorities before mining is allowed to begin. All forms of mining are likely to generate areas where coal is stacked. When the coal has significant sulfur content, the coal heaps generate highly acidic, metal-rich drainage when exposed to normal rainfall. These liquors can severely damage receiving water courses. To mitigate these problems in developed countries, the quality of water is continuously monitored at coal mines. The five principal technologies used to control water flow at mine sites are: diversion systems, containment ponds, groundwater pumping systems, subsurface drainage systems, and subsurface barriers. Contaminated water is generally pumped to a treatment facility that neutralizes the contaminants. The combustion of coal produces carbon dioxide (CO2) and nitrogen oxides (NOx), with varying amounts of sulfur dioxide (SO2) and other pollutants, depending on where it was mined. Coal-fired power plants represent the largest source of carbon dioxide emissions, which is thought to be a major cause of global warming. Coal mining and abandoned mines also emit methane, another gas associated with global warming. Sulfur dioxide reacts with oxygen to form sulfur trioxide (SO3) gas, which in turn reacts with moisture in the air to form sulfuric acid. This acid in the atmosphere is returned to the Earth in the form of acid rain. The waste products of burning coal include fly ash, bottom ash, and boiler slag. Many heavy metals may be released—such as arsenic, lead, mercury, nickel, vanadium, beryllium, cadmium, barium, chromium, copper, molybdenum, zinc, and selenium. Coal also contains low levels of radium, uranium, thorium, and other naturally occurring radioactive isotopes. Although these substances are trace impurities, enough coal is burned that they add up to significant amounts. They can be dangerous if released into the environment. Modern power plants utilize a variety of techniques to limit the harmfulness of their waste products and improve the efficiency of burning. These techniques, however, are not always implemented, as they add to the capital cost of the power plant. To eliminate CO2 emissions from coal plants, carbon capture and storage has been proposed but has yet to be commercially used. Hundreds of coal fires are burning around the world. Underground fires can be difficult to locate and many cannot be extinguished. These fires can cause the ground above to subside. In addition, combustion gases are dangerous to life, and when they break out to the surface, they can initiate surface wildfires. In the United States, a trash fire was lit in a landfill located in an abandoned anthracite mine pit in a part of the coal region called Centralia, Pennsylvania, in 1962. It continues to burn underground, 44 years later. It has been estimated that, as of 1996, there is around one exagram (1 × 1015 kilograms) of total coal reserves accessible using current mining technology, approximately half of it being hard coal. The energy value of all the world's coal is well over 100,000 quadrillion British thermal units (Btu) (or 100 zettajoules). Coal regions in the United States. According to some estimates, there is enough coal to last for 300 years. This prediction, however, assumes no rise in population, and no increased use of coal to attempt to compensate for the depletion of natural gas and petroleum. In a 2003 study, Gregson Vaux took those factors into account and estimated that coal production in the United States could peak as early as 2046. The term "peak" does not mean that coal will disappear, but it defines the time after which coal production will begin to decline in quantity and energy content. The disappearance of coal is expected to occur much later, around the year 2267, assuming other factors do not change. ↑ Energy Information Administration, Department of Energy Accessed on May 20, 2006. ↑ International Energy Outlook Accessed on September 9, 2005. ↑ Gasification Technology Accessed on June 8, 2006. ↑ Cleaner Coal Technology Programme, Technology Status Report 010: Coal Liquefaction Department of Trade and Industry (UK), October 1999. ↑ Oil from Coal—Free! The Karrick LTC Process Accessed on August 1, 2006. ↑ Diesel Fuel News: Ultra-clean fuels from coal liquefaction: China about to launch big projects Accessed on September 9, 2005. ↑ Welcome to Coal People Magazine Accessed on September 9, 2005. ↑ Coal Combustion: Nuclear Resource or Danger Accessed on August 1, 2006. ↑ Radioactive Elements in Coal and Fly Ash, USGS Factsheet FS-163-97 Accessed on August 1, 2006. ↑ Sino German Coal fire project Accessed on September 9, 2005. ↑ Committee on Resources-Index Accessed on September 9, 2005. ↑ Snapshots 2003—Wyoming BLM Extinguishes 57 Coal Seam Fires. Accessed on August 1, 2006. ↑ EHP 110-5, 2002: Forum Accessed on September 9, 2005. ↑ Overview about ITC's activities in China Accessed on September 9, 2005. ↑ North Dakota's Clinker Accessed on September 9, 2005. ↑ BLM Education - The High Plains: Land of Extremes Accessed on August 1, 2006. ↑ Pyrophoricity (spontaneous combustion) of Powder River Basin coals—considerations for coalbed methane development, Wyoming State Geological Survey Accessed on August 1, 2006. ↑ Burning Mountain Nature Reserve Accessed on September 9, 2005. ↑ The Peak in U.S. Coal Production Accessed on September 9, 2005. ↑ International Energy Annual 2004: Reserves, Energy Information Administration Accessed on August 1, 2006. Dublin, Thomas and Walter Licht. (2005) The Face of Decline: The Pennsylvania Anthracite Region in the Twentieth Century. Cornell University Press. ISBN 0801484731. Rottenberg, Dan. 2003 In the Kingdom of Coal; An American Family and the Rock That Changed the World. Routledge ISBN 0415935229. Williams, Robert H. and Eric D. Larson. A comparison of direct and indirect liquefaction technologies for making fluid fuels from coal. Energy for Sustainable Development VII (December 2003): 103-129 . Retrieved April 1, 2008. This page was last modified on 6 March 2017, at 20:48.